This ready-made first course has a frivolous fish sauce with squid, shrimp, cuttlefish, mussels and clams. 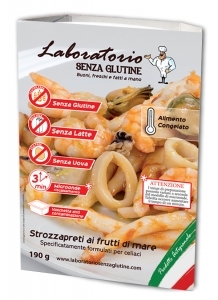 Rice flour, potato starch, tomato, squid 12%, shrimp 6%, cuttlefish 6%, mussels 6%, clams 6%, extra virgin olive oil, sunflower oil, guar flour (E412), parsley, garlic. It may contain traces of shells.